Jonathan Abrams, whose resume as a founder or co-founder includes the Founders Den startup workspace, event service Socializr, social bookmarking service HotLinks, and Friendster (I don’t need to explain that last one, do I? 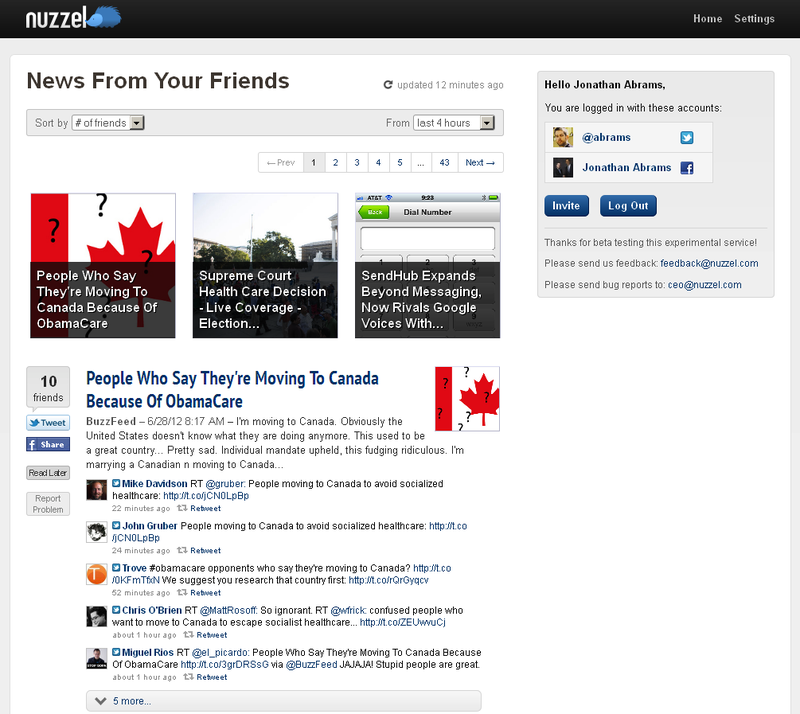 ), is launching his latest startup today: Nuzzel, a site for browsing the news that your friends have shared on social networks. There seems to be a glut of social newsreading services, but Abrams says there’s nothing that delivers the experience he’s looking for — something fast, easy-to-use, and social. To demonstrate that, he had me create my own Nuzzel account. I connected my Twitter account (you can connect Facebook, too), and within seconds, I had a page of headlines shared by the people I follow on Twitter, along with their commentary, and related news and stories from sites like Reddit, Hacker News, and Techmeme. It’s a clean, intuitive layout, allowing you to browse a bunch of headlines quickly, see which friends are sharing them, and read what those friends had to say about the news. The headlines can be arranged based on how many of your friends shared them (so that the most-shared news is at the top), or arranged chronologically. Abrams’ approach is pretty different from the newsreading apps that I’ve been seeing recently. For example, Prismatic CEO Bradford Cross prides himself on the fact that Prismatic isn’t just presenting stories from users’ Twitter feeds, and instead tries to understand their interests. Abrams, on the other hand, wholeheartedly embraces the idea that this is content that you could also see on Twitter and Facebook. In fact, he says he originally created the site based on his Twitter usage — as he followed more people on Twitter, that’s where he started to get more and more of his news, rather than from RSS. But he knew also he was also missing a lot of content because he wasn’t on Twitter all the time. Abrams says he’s skeptical about delivering news tailored to a user’s interests, rather than social signals. You don’t want to force users to enter their interests, because, “People don’t want to do a lot of work.” Also, people are interested in different topics to different degrees. That’s hard to gauge with technology, but in some ways your social connections serve as a decent proxy — Abrams says he’s very interested in technology and entrepreneurship, and only casually interested in politics, and that’s reflected in who he follows. 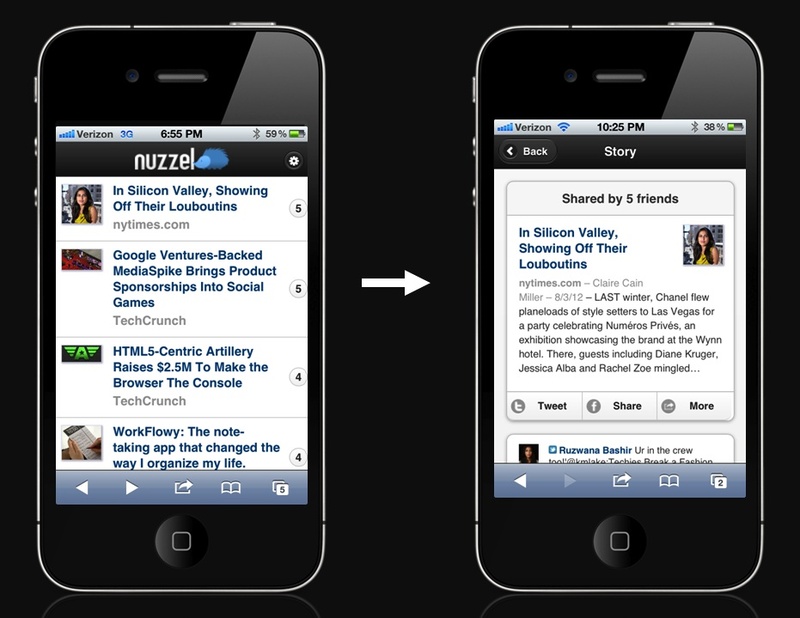 The service is also available as a mobile website, and users get daily email news digests. Why not an iPhone app? For the simple reason that Abrams has been working on this as a solo project, and he says, “I don’t know how to write iOS apps.” Plus, he wanted to iterate on the early version of the app without getting App Store approval for each update. Now that the site is public, Abrams is ready to raise some money and hire a team, and the to-do list will include building native mobile apps. Ultimately, he says his goal is to be completely platform agnostic. As for the business model, Abrams says he wants to introduce sponsored stories to the feed.